Feeling forced to act like an hombre and adhere to strict gender roles harms people of every gender. I witness machismo when “Pareces una vieja” is the greatest insult to a teenage boy and when a man feels he has divine authority to abuse his wife. 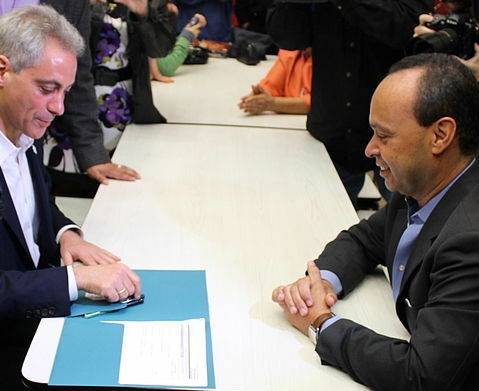 Machismo hinders the development of our community, which is why Congressman Luis Gutiérrez’s endorsement for Rahm Emanuel is problematic. There are many things I look for in a mayor: integrity, leadership, involvement. Not on my list is a misogynistic sense of humor. Instead of saying that Rahm is assertive or that Rahm is powerful, Congressman Gutiérrez tells viewers that “Rahm tiene pantalones.” Undoubtedly, pants represent masculinity. This is why people ask “Who wears the pants?” instead of “Who is making the decisions?” or “Who is acting like a man?” Gutiérrez’s joke bolsters Rahm’s masculinity and claims that the other candidates are effeminate. Even worse, this means that he believes being associated with women is a bad thing for government. There is no way to explain this joke without admitting that it is sexist. When my father, whose boots are almost as piercing as his machista attitude, wonders why someone thought this joke was acceptable for a political campaign, you know there is a serious problem. Mr. Congressman, please tell me why being a woman is so offensive. Please explain to women voters why effective leadership is a male trait and why we should vote for someone because he is more macho than the rest. Mr. Congressman, if you so desperately desire to disassociate yourself and the person you endorse from 50% of the population, maybe you should not be representing us at all. Karina Pantoja is a senior at Walter Payton College Prep. She is passionate about issues affecting the Latino community. She co-runs Esteemed, a self-esteem and self-love club at school. In her free time, she cheers on Los Cachorros and volunteers at her church.